SEIKO lenses are designed and manufactured using the very latest technology. To achieve the very best vision from your lenses, it is important that specific facial measurements are taken accurately. We therefore recommend that you purchase your SEIKO lenses at a registered optical practice. 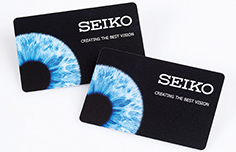 An authenticity card is supplied with every pair of SEIKO lenses. This is your guarantee that you are purchasing a genuine SEIKO product. Our network of SEIKO Lens Specialists regularly receive training to ensure your lenses are dispensed and fitted correctly. Please use the “Locate Your Local SEIKO Lens Specialist” link on the Homepage.